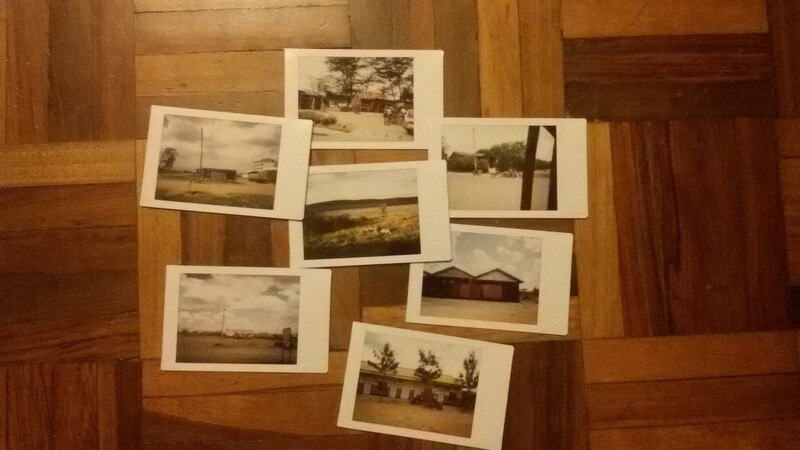 Over our travels, we took a stop in Kenya. Falling in love with the diverse landscape — the Great Rift Valley, the cityscape of Nairobi, and the drifting away on the beaches near Mombasa — we find a special place for these memories. Each place deserves its own dedicated post and as such, we will write this in parts. 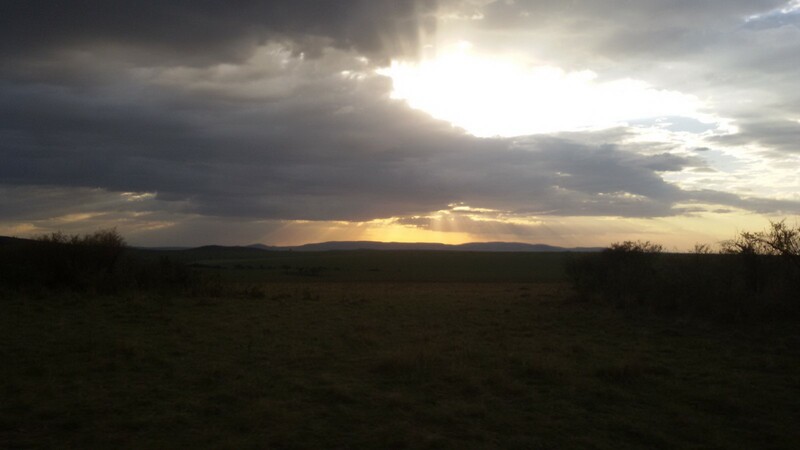 First up: Nairobi to the Maasai Mara Reserve. Arriving at 3am in a flight through Morocco, already void of sleep but energized by the newness of the place :: the sights, sounds, smells, and vibe. I spot a friend at the airport, and since my driver did not show up, I crash at her place for the night. Rather a coincidence to see a face I know in a continent unknown to me, but the world is small and perhaps it’s not that strange. I only have four hours until I need to load a van to travel to the South. I know the sleep I crave shall not be granted, but not matter — this is better. The same driver who dropped us off arranged to catch me in a few hours. Dogs barking and the sun barely showing, I stand guard for the two headlights to appear. The cook drags himself awake and opens the gate for me to leave. 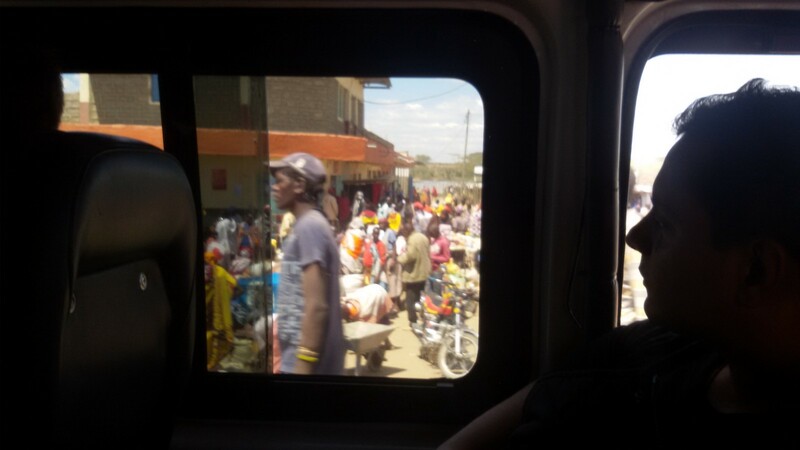 On the ride over to the drop off location, we chat Nairobi, Kenya, and of course, musicians I need to learn about. This is a standard question I ask whenever I meet a person from a different country: “who are your favorite musicians?” He gives me a few names and I jot these down to later explore. A friend meets me at the hotel and we are anxious for the next few days. Unknown what is to follow, but an adventure is assumed. We chat wearily about random thoughts and absently check if we’ve forgotten anything. In all honesty, I am unprepared — my habit of just saying “Yes” without a lot of research has once again reared its head. Yet, this tendency has led to wonderful memories, allowed me to feel this sense of wanderlust, and at worst, given me funny stories to tell. If you’re never a tourist then you never travel. A stop at the market and sandwiches abound. I neglected to check the map and I learn this is a seven hour drive, not a two hour drive that I assumed. No matter — I’m not looking for convenience or comfort, I am looking for the unknown and chasing that wanderlust feeling. “How many stories and lives here are to be lived,” I wonder as we stream by faces, conversations, and people in their day-to-day. I always get caught up in thinking about what this person’s life may be like, what they think about, what they do, their perspective. I stop myself from going down that path for a moment. I’m in a van with strangers and should be social. I look around and see that we’re all peering out the window, perhaps wondering the same about the lives we’re passing by. The drive itself is a catalogue of landscapes. After intense traffic and maneuvering through impossible vehicle scenarios, we are out of the center. Finally a bit of freeway. It’s lined with palm trees and people walking somewhere, a different version of a freeway that I’m accustomed to and only serves to intensify this feeling that I’m in a foreign place. I love it. 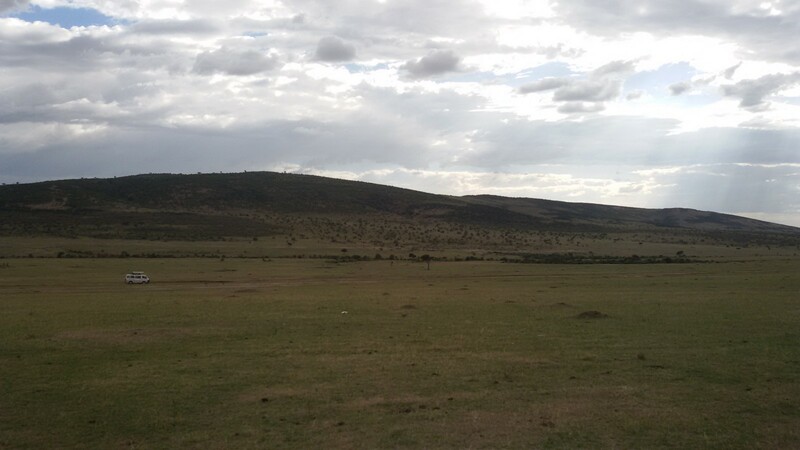 We are heading south towards the Great Rift Valley. Generating from the Gulf of Aden down through Ethiopia and Kenya, this rift ends in Northern Tanzania. 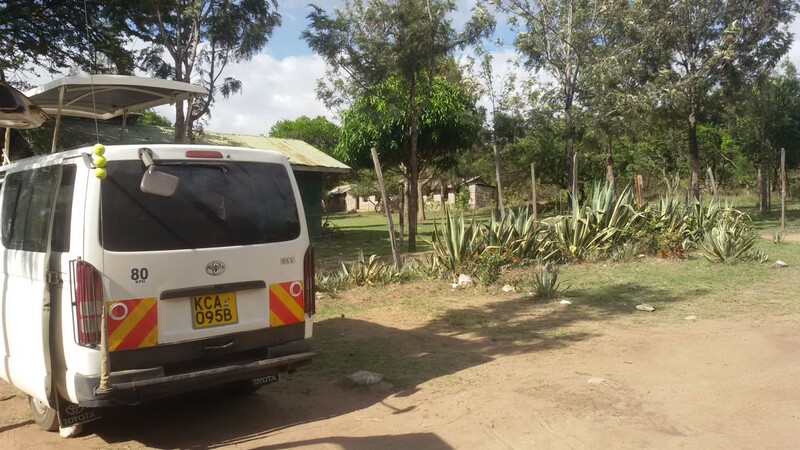 We are heading to the Maasai Mara National Reserve. 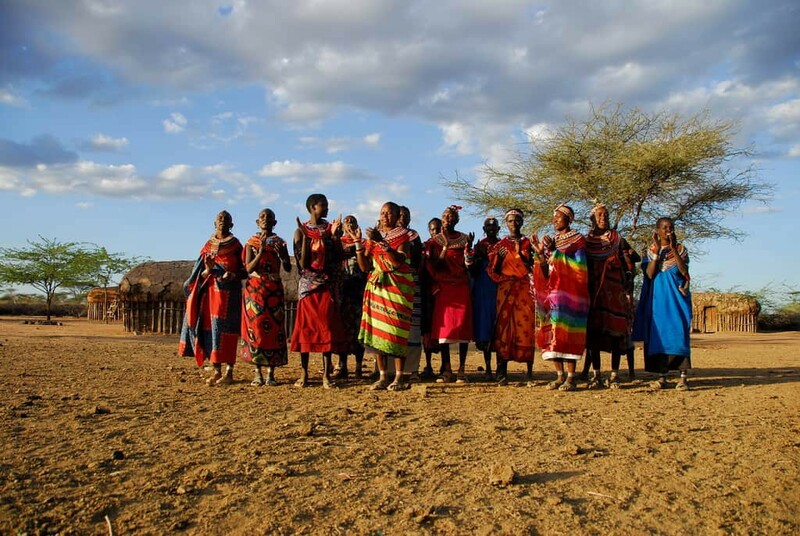 I’ve seen photos of the Maasai and I’m intrigued to learn about their lives, textiles, and crafts. There is so much history and culture built into even just a color choice or a pattern of weaving. On the way, I learn our drivers are skilled. We travel from paved road to dirt road and this eventually becomes a sand road with dunes on the side. To maximize speed, our driver cruises the wrong direction, weaving up and down the sand dune. I suppose this allows us reprieve from the jarring (and noisy) hard sand road that has corrugated rifts instead of a smooth surface. It seems they’ve done this before so I am comfortable to with the 35˚ tilt and possible head-on collision. 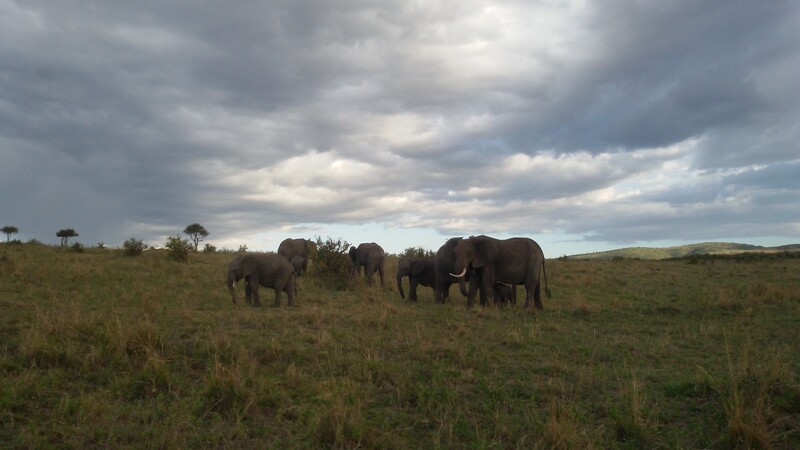 We arrive at a camp near the Oloololo Gate, which is the entrance of the Mara Triangle Reserve. A camp with semi-permanent tents, nestled around a main dining hall. Strange cats roam the place and I like that it’s pretty low-key. I am not interested in a gla-mping (glam-camping) situation and would rather feel a bit closer to nature. I do learn that wild animals have come through camp but hopefully the guards know how to handle it. I’m a bit uneasy but I am here and it’s not point to worry, rather stay vigilant instead. A quick drop off of our bags and we congregate back at the vans. 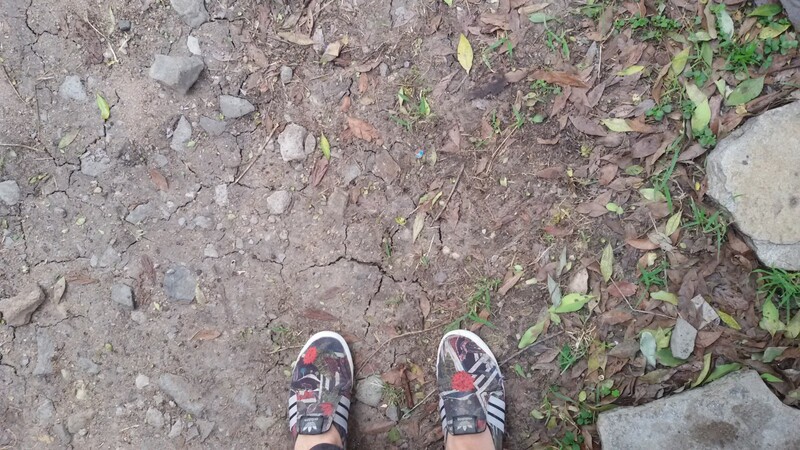 We’re to go on a small expedition and look for animals. I’m not versed on the safari goals, but I learn we are looking for the Big Five: Lion, Leopard, Rhinoceros, Cape Buffalo, and the Elephant. Our guides drive us to the Oloololo Gate and they speak in Swahili over their radios — sharing animal locations so that we can drive and catch a glimpse. From the smiles on their faces, I can tell they are taunting each other and they see this as sort of a game with each other. I ask what they are saying and I’m told they are yelling, “go” at each other in Swahili, as a sort of race. Though this is unique for me, this is the norm for them as they drive out thousands of people for their first safari experience. It must be interesting to bear witness to newness in others’ eyes. Or perhaps even that gets old after a while and there’s a need to find new entertainment. A mix of wonder, uneasiness, and trying to live in the moment, my eyes scan the horizon looking for one of the Big Five. It’s a large reserve with mountains, open field, and water. Animals dot the grounds in their herds and they carry on. As the day passes, we move from one area to the next and slowly check off our list. Majestic animals and it’s hard for me to picture man killing them for sport. Inside each herd is its own dynamic, set of social mores and how they conduct themselves — You see a baby elephant and it is shielded by the elders. 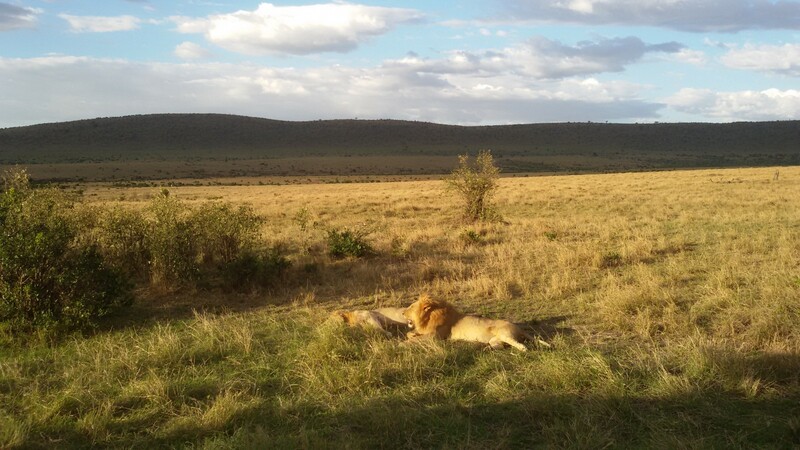 You see two brother lions as they bathe in the sun, our guide tells us they must be brothers because unrelated males would not do this. Giraffes and gazelles are at ease near each other, but keep tabs in case the other alerts of a predator. Herd of Elephants as they guard their infant, next generation. Our excursion closes and we head back to camp. 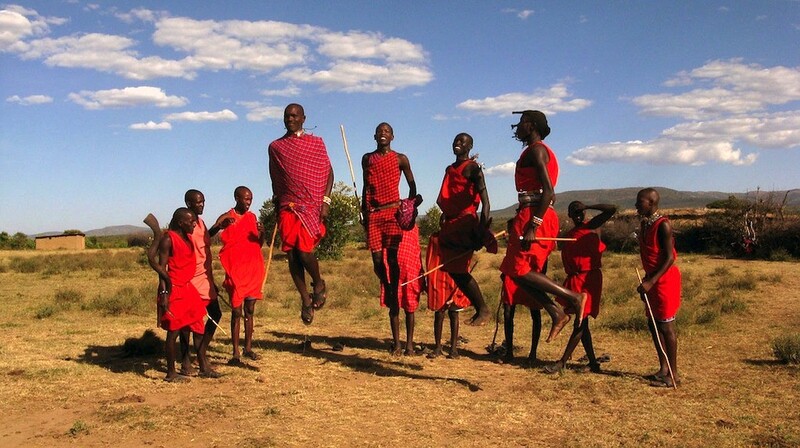 On the way, we pass by some people of the Maasai tribe. You know this because their colorful beadwork and plaid-patterned clothing. The women sell handicrafts and the men shuttle goats through the fields. We continue on and I try to respectfully observe and engage. I’m intrigued by the fabrics and the beading patterns — plaids in red, brightly colored beads and elaborate headpieces. Many wear the Shúkà, Maa word for “sheet” and this comes in a variety of patterns, mostly in red. The beaded jewelry caught my eye, I’m intrigued. 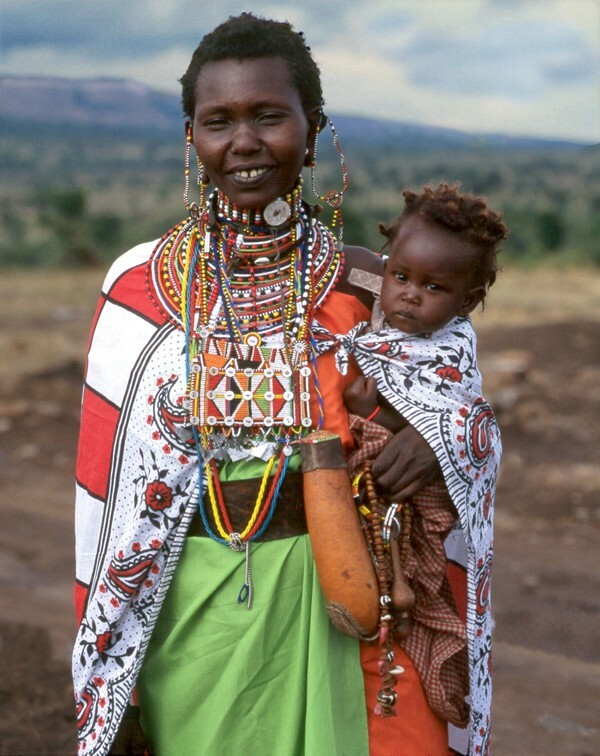 I learned that the Maasai have always made jewelry but it changed from being made of clay, wood and other natural material to be made of glass beads, when European traders brought them in during the 1800s. The colors constitute meaning and much centers around cattle, their life sustainer. Red is the symbol for bravery and, most importantly, for unity since it is the color of the cow’s blood. When a cow is slaughtered, it brings together the community for celebrations and nourishes everyone. White is the color of the cow’s milk and means purity, as the cow is the pure and sacred animal. Blue is for the sky, bringer of the rain and green is for health, symbolizing the Earth which provides sustenance. Finally, black for the people and the trials through which they avail. The women crowd our van, knowing that we are tempted to make a purchase. They have beautiful faces and I study their style — most have pierced ears and weathered skin, decorated with these ornate headpieces; every part is covered by design. Overwhelmed but wanting to buy something, I make a small purchase — a Shúkà and a few beaded pieces. 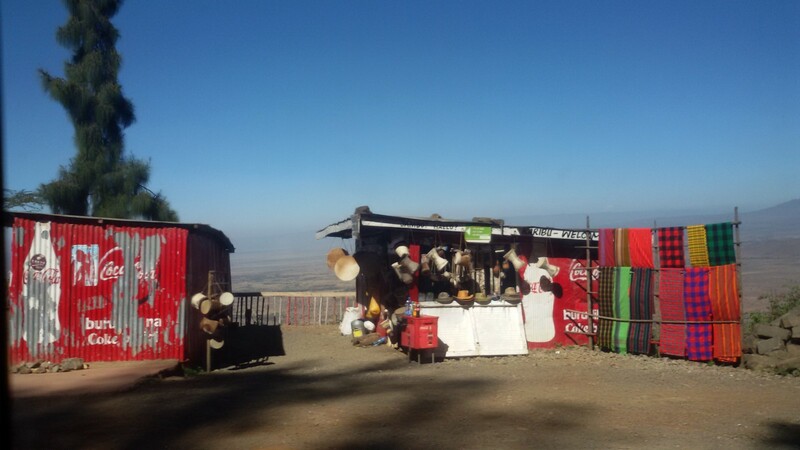 When I look at the Shúkà, I recall this memory and I am temporarily brought back to this moment somewhere in Kenya. We returned to our camp and come to the mess hall for dinner. Beans, rice, and greens of some sort. We sit in a large room with the news on and dim lights. I want to socialize, but I am eager to escape back to my tent so that I can write these memories down and meditate on this experience. A distant land, new people, and a curiosity on how others live. I feel small and insignificant in this world and that brings a new perspective. These new experiences are pushing me towards another evolution, nothing distinct but another way to look at the world and myself within it. After all, that’s the point of travel, no? To discover as much about yourself as you do about the world — a reflection of, a contrast to, and something within it. I fall asleep with the notion that we rise in a few hours for a sunrise tour. A new day and next experiences.